Nene Valley Harriers win the Southern Athletics League! A great weekend for the club started off down at Southampton on Saturday 19 August. Nene Valley Harriers first won the league two years ago but confirmation did not come for a few days due to the close match point win; this time was different, there were no doubts after achieving an incredible 100% record throughout the season. The club won their matches at Peterborough, Bedford, Colchester, Crawley and this weekend at Southampton. This season’s title has come from repeated teamwork, commitment and hard effort with athletes competing in multiple events for the best of the club rather than necessarily for them individually; there are other competitions available for them. As a team manager it would is great to get congratulations from the other teams but once again this Saturday was different. 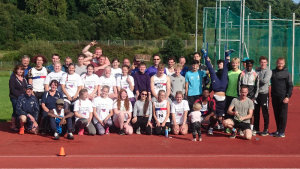 The clubs athletes and supporters received compliments about how our team held themselves up as sportsmen both in the field and on the track, in the stands supporting and a certain Adam Fidget for helping high jumpers from all clubs whilst he was supporting the officials. The officials have been brilliant all season. Sally Pusey, Mick Lynas, Brenda and Ray Church, Andy and Amanda Stubley and Andrea Chapman who have travelled all round the southern area and also the several others who have stepped in to help when needed. These people are not only vital for the meeting to happen but they have also scored important match points. Ultimately the athletes have been the important ones and we have seen a number of the clubs under 17s really move their careers forward by competing alongside their senior ranks. These athletes have been given the opportunity to learn from their team mates and those of other clubs. This league is known for both sportsmanship and the competitiveness which is present at6 every match. One such athlete was Ronan Rawlings who achieved a close fought double sprint victory in the 100m and 200m. Also coming through into the senior squad were brother and sister Aaron and Saskia Hunt. Aaron like the rest of the men’s team, in the vicinity ready for the following day’s British League Match winning the 800m in marginally under two minutes, supported by Ollie Bowling unlucky not to break the magic barrier with two minutes dead. Saskia, usually a cross country and road athlete ‘volunteered’ for the 3,000m in order to fill spaces and picked up good points in doing so. Meanwhile, another under 17 lady, Alex Stubley competed in the javelin after getting clearance from her physio just two days before the match, scored valuable points, along with mum and dad who had helped to ensure the club had sufficient officials – all three scoring throughout the season. The value to the young members of the team comes from older ones. Athletes such as Sean beard in the men’s 5,000m, Simon Achurch winning the Hammer and throwing anything else he could find to gain points all season and Andrea Jenkins who although not present Saturday has scored well to help set up the league position before this final encounter. There were numerous good performances in far from perfect conditions especially noting Cipriano Miranda (Cipi) who jumped in all directions winning the long, triple and High jump competitions. Cipi, a new comer to the team this season showing what a valuable asset he is for the club. From one of the finds of the season to one of the most improved atheltes, who has now established himself as a regular in the Southern and British League squads, Sean Garmory. His return from Northumbria University has seen a marked improvement in his 400m almost race on race. In the ladies Emily Maltby, once again competed in 5 individual events and recording 4 second place results as well as second in the 4 x 100m relay. Ellie Mae Stokes stepped in to cover the 200m but still won her long jump and second in the triple jump. Under 20 lady, Megan Pusey usually a B string long sprints athlete, stepped up as the leading 200m and 400m runner enabling good points to be scored; even running the 100m immediately before her 400m so that the team did not lose points.